On Thursday, November 19 an exclusive ‘time machine’ vertical tasting has taken place at the 3-Michelin Star restaurant Da Vittorio in Bergamo, promoted by the Seminario Veronelli wine institute. Andrea Bonini, director of the Seminario Veronelli, conducted a fascinating journey throughout an exciting line-up of mature, élite Italian wines, ranging from a 1998 Franciacorta Extra-Brut to a 1997 Moscato Passito from Piemonte. 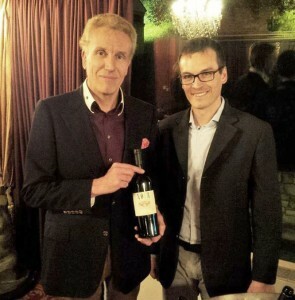 Tenuta Mazzolino was invited to present a ‘library release’ of our top wine Pinot Nero ‘Noir’. We opted for the 1995 vintage, as it marked a turning point in both the history of our estate and the winemaking protocol of the wine itself. Given the high-flying context and line-up of wines…we are pretty happy at the show our 1995 ‘Noir’ put on in the glass…take a look at the report available on the Seminario Veronelli web-site below. Our heartfelt thanksgiving goes to Andrea Bonini and Andrea Alpi at the Seminario Veronelli for the brilliant event!